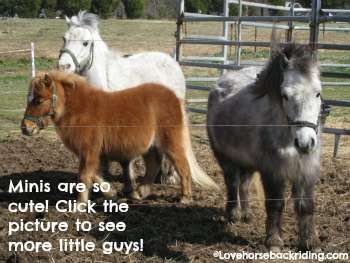 Enjoy these cute horse pictures that I hope will leave you grinning! 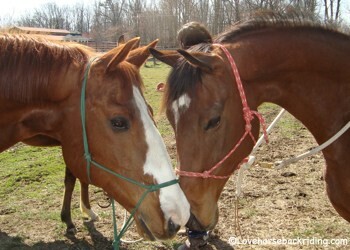 Here are two horses greeting each other, a chestnut (left) and a young bay mare. Did you know this is how horses get to know each other? They get close and smell each other and touch noses. 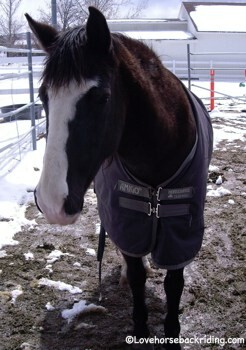 Check out this cute mare with almost a full white blaze enjoying the warmth of her winter blanket. She has a very sweet face. She used to be wild. This cutie lived for 2 years out on the range and now enjoys a life of luxury including grain, her own barn, and of course a cozy winter blanket. As adorable pictures go, three winter wooly minis are hard to beat. They are so small but pack some seriously cute punch! Even their names are adorable. Honey, Salt, and Pepper. Can you figure out who is who? 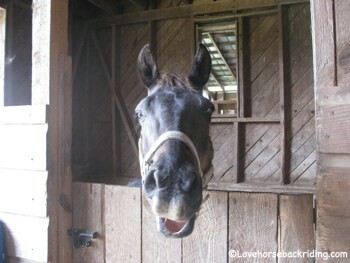 Charlie is a cute black pony that stands about 13.1hh. He spends most of his free time eating and roaming around his five acre pasture. When he is working as a lesson horse, he is patiently teaching beginners how to ride in the arena and out on the trails. He has some funny antics he likes to entertain people with such as that cute lower lip hanging down and then flapping it! This is one of my favorite pictures because I love to watch horses groom each other. I love the way they both find each others itchy spots and then get to it! In the front of this picture is a bay Thoroughbred, and behind him is a young Tennessee Walking Mare. Did you know that finding your equine partner's itchy spots and rubbing them is a great way to build your relationship with him? Go from cute horse pictures back to the index page so you can learn even more about different breeds and how to take care of and ride horses.